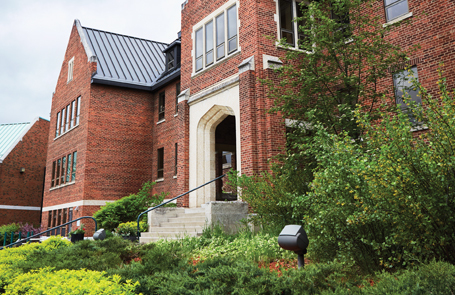 The Physical Plant Department at Algoma University is responsible for the up-keep and maintenance of the University’s grounds and buildings as well as the planning, development, and construction of new infrastructure. The department is responsible for logistics and mail services, security, and energy management. We also work with vendors and community partners to coordinate new construction and renovations of existing buildings and infrastructure. Algoma University’s Physical Plant Department is dedicated to ensuring that all of its products and projects contribute to the Council of Ontario Universities (COU) “Going Green” initiative. The University continues to find innovative practices and solutions and uses environmentally friendly products. In recent years, the University has implemented a new recycling program with RPR Environmental, received energy rebates for using high-efficiency-condensing boilers, and created the greenest building in Sault Ste. Marie, the Essar Convergence Centre, the University’s state-of-the-art building for the sciences. The George Leach Centre (GLC), the University’s athletic centre, is home to 540 solar panels, which creates green energy. Algoma University’s custodial staff was also awarded Green Certification for switching to greener cleaning solutions, making Algoma U the first educational institution to receive this commendation. We were also recently awarded the 5-Star Energy Cost Index award for the application of air filtration products to improve indoor air quality. In keeping with its objective to contribute to the “Going Green” initiative, the University has implemented its first Energy Conservation and Demand Management Plan (PDF). If you have questions please contact the Department of Physical Plant by submitting a ticket request through the the employee portal. To create a ticket, please refer to the instructions below. Fill out the ticket with the appropriate information, including client’s name, email, telephone number with extension, and the reason for the request. For information on Physical Plant policies, please visit the Policies and Procedures section.